Next time you’re at the Minturn Anglers fly shop in Minturn, be sure to ask one of the staff to spend a few minutes to show you the best fly casting approaches for dealing with windy conditions on the water. Practice your casts on the Eagle River that runs right behind the shop when one of the staff has time to coach you with expert advice. Dealing with the wind is one of the more significant weather problems that fishermen face. When I first began fly fishing, it was tempting to avoid going out on those days when the wind was strong enough to be affecting my casts. Luckily, I was hanging out with more experienced anglers who managed to guide me into accepting winds as simply another challenge to be conquered. 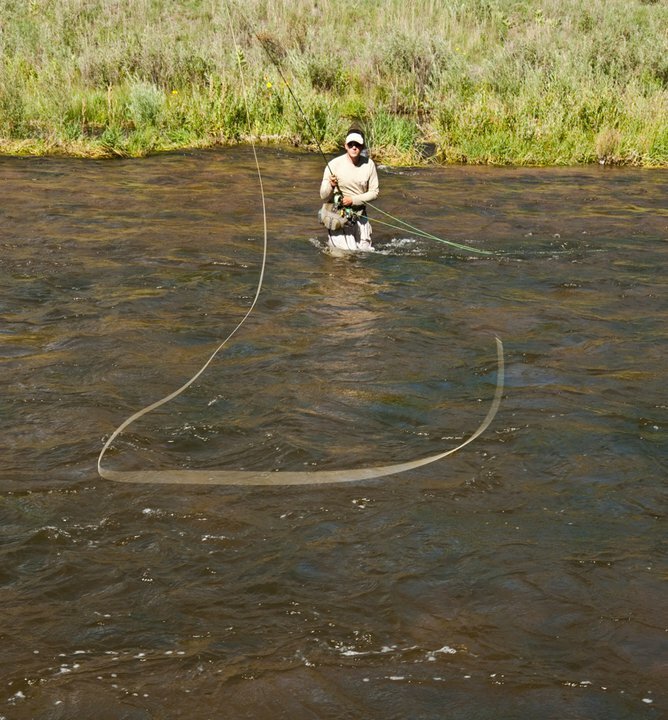 How does the wind affect the success of your fly fishing? As every angler quickly finds out, even a light breeze impacts the accuracy of a cast. This can be crucial when fishing tailwaters or spring creeks and trying to put the fly into a narrow feeding lane. Wind will increase the drag on the fly and tippet caused by the current. A rising wind can also be an indicator of significant barometric changes which in turn affect how fish are feeding. Decreases in hatch activity are common with increased winds. Experienced anglers cast accurately in the wind by driving forward casts very low, working to have the loop unroll right above the target location. Keeping the loop low helps keeps it out of the wind and reduces wind effects on placement of the fly. If you are dealing with an upstream wind, a traditional upstream cast seems to work best, as surface wave action tends to hide the drag that results from this type of presentation. On the other hand, if there is a downstream wind, try a reach cast to place the fly slightly above the target, and then dropping the rod tip quickly to place the fly in the feeding lane. Fly fishing in windy conditions can produce positive results ̶ even if the trout elude you! Improving your technical skills in casting and placing the fly is always satisfying. And remember that persistent practice leads to impeccable technique and fly fishing success.